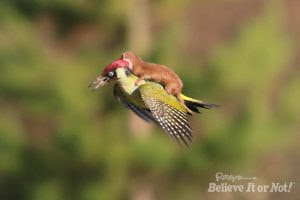 It's that time of year again for a new Ripley's Believe it or Not! Book!! This one subtitled, Unlock the Weird. My kids are pretty enthralled with these books as we continue to collect each years edition. They are into 'weird'. It certainly opens up some unique discussions as we look through the weirdness. Ten different chapters to categorize the weird of the weird. This large, hardcover book has some excellent photos in it! Read about one man’s attempt to take a break from reality, spending three days climbing the Swiss Alps on all fours as a goat! Soar on jetpacks above the deserts of Dubai with breathtaking aerial imagery. Meet Birdman Ted Richards who had his ears removed and his face and eyeballs tattooed to look like his pet parrots! Savor the flavor of sheep dung spitting, an Irish event that is just as unappetizing as it sounds! See double with Twin Strangers’s Niamh Geaney, who has found multiple doppelgängers that look exactly like her! Not everything is scary weird either. 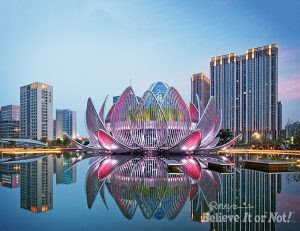 I really was impressed with this Lotus Building in China. Pick up a copy on Amazon today! Christmas Cards, Why send them?